The owners of this lovely little house in Orlando, Florida, Jason and Jennifer Helvenston, are facing a fine of $500 a day. Why one might ask? What is their affront to the good people of Orlando? 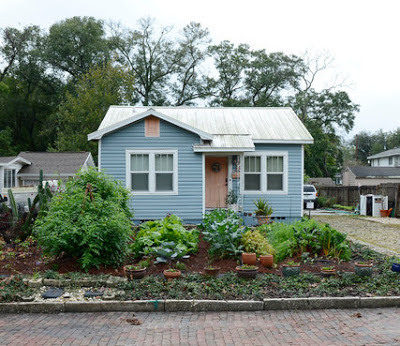 They have planted vegetables in their front yard. Yes, vegetables. Evidently in Orlando, one is fined $500 a DAY for gardening. I wonder if there is a fine for owning an AK-47? Check out Mark Bittman's New York Times article. Sick. I am glad I don't live in that town. The neighbors and townspeople should all plant a vegetable garden. Fight back.